On Thursday night, poets Adam Boehmer, Christine Deavel, James Hoch, and Janie Miller kicked off a new poetry series, the Unauthorized Readings, with a hearty and variegated performance of Walt Whitman’s “Song of Myself.” A crowd of about fifty gathered in the basement of the Fremont Abbey Arts Center, where the four readers took turns delivering selections from the poem, each with no small measure of zeal. 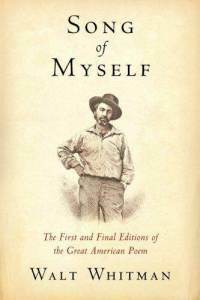 Theirs was a skillful and imaginative rendering of Whitman, with each poet’s distinct reading style highlighting the competing tones that cycle throughout the work: playfulness and hysteria, didacticism and uncertainty, mysticism and sexuality. Boehmer then took the stage, accompanied by violinist Jackie An, with whom he has performed and recorded under his folk-music moniker Tenderfoot. By way of loops and various effects and distortions, An filled the room with a fuzzy, major-key vamp redolent of the Icelandic post-rock band Sigur Rós, over which Boehmer, draped in a small sheepskin mantle, read his sections in a voice that ranged from ecstatic to tearful. Among others, Boehmer recited the famous bathers scene, Section 11, in which the speaker, recounting a young woman’s fantasy of a crowd of young men bathing, gives an honest, open articulation of female sexuality—which articulation would have been immensely audacious when the poem was first published in 1855. All four readers returned to the stage at the end of the performance to present the final fifty-second section together. Local funk connoisseurs the Fabulous Party Boys followed with a musical postlude, rounding out the evening with jams of Whitman-esque swank and panache. The Unauthorized Readings is a new series put on by the LA Review, with the intention of bringing classic works of poetry to life in performances by latter-day poets who love them. To that end, Boehmer, Deavel, and Miller gave an interview with City Arts magazine in which they discuss Whitman, “Song of Myself,” and what the two have meant to them—as poets, as people, and even as beard-wearers. Their comments are intelligent, delightful, and worth checking out, as will be future Unauthorized Readings, if this first one is any indication. We’ll post word of the next installment in the series on Facebook.